On the four main islands of the Japanese archipelago, approximately half the population of the United States is packed into an area about the size of California. Japan may be densely populated, but the people coexist peacefully— even harmoniously—thanks in part to millennia of Buddhist and Shinto influence. Both traditions permeate the Japanese sensibility. They are apparent in cultural events and day-to-day life, and they are especially apparent in landscaping and garden design. A Japanese garden changes with the seasons. 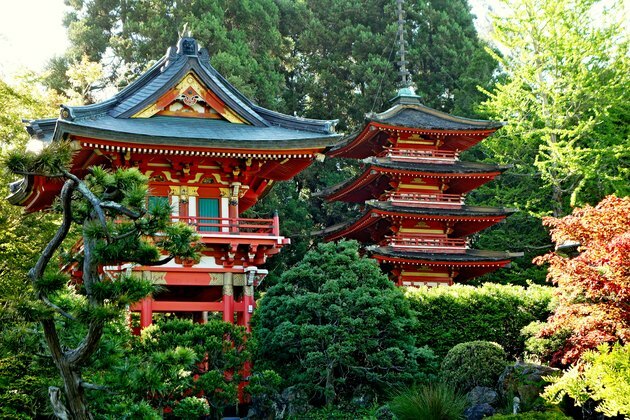 A Japanese garden is a retreat from worldly life and a shrine to the natural world. It's a place to meditate and to appreciate the subtle variations in color and texture that exist in the abundant woodlands, mountains and waterways that dot the humid and temperate island nation. It's also a place to ponder the mysteries of life while steeped in aesthetic minimalism. A Japanese garden is never showy, and it doesn't attempt to impress. It's a place where you can sink into a state of relaxation in which the mind loses its power to separate you from the nature around you. Although the design of a Japanese garden is minimalist, a fair amount of effort goes into its implementation and maintenance. If you want to create a Japanese garden where you live, plan on incorporating as many of the four main elements as you can. They include water features, plants (of course), rocks, and traditional decorations such as stone lanterns. You can also add some purely optional touches, such as fish in a pond or a serene bridge. 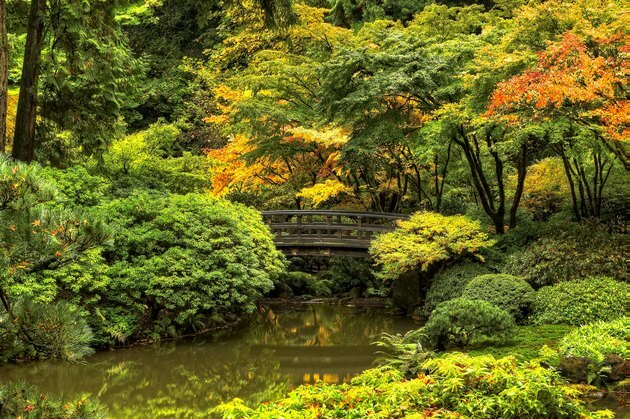 Here are a few other pointers to keep in mind when designing a Japanese garden. Designers sometimes punctuate the greenery with contrasting red structures. Some gardens are full of strikingly beautiful flowers and whimsical gnomes, but not a Japanese garden. The plants of choice are conifers, such as pine and cedar, wood ferns, decorative grasses, including bamboo, and mosses. Japanese maple is a great addition because its dramatic orange coloration in the fall provides a striking contrast to the ambient greenery. Note that all of these plants are non-flowering and predominantly green. If you want flowers, consider graceful lilies, frilly primroses or delicate irises. You don't have to avoid color altogether. Clumps of multi-colored azaleas are quintessentially Japanese. If they are placed properly and don't dominate, they add an eye-catching element of excitement. Remember that every element of a Japanese garden should harmonize with the others and combinations that work best are those that flower at different times of the year. Not all Japanese gardens have a water feature, but if yours has a pond, and the climate allows, bring in some water lilies or lotus plants. The lotus is an ancient symbol of enlightenment and is an especially good choice. Plant moss around the pond to help integrate the water feature with the rest of the greenery. A simple wall separates gardens like Ryoanji in Kyoto from the hubbub of daily life. A Japanese garden should harmonize with the environment around it, but it isn't an extension of it. It is meant to be a separate feature. Preserve the sanctuary-like character of the garden by erecting a simple barrier around it. Although it may be undramatic, the barrier should create a definite boundary. Many temple gardens in Japan are surrounded by featureless stone or masonry walls, but you don't have to make anything so elaborate. A bamboo fence works just as well, as long as you can't see through it. You can also create a living barrier with shrubs, bamboo and small conifers. Sometimes, the lay of the land provides natural barriers, such as hills or a stream. Go ahead and work these into the garden design. That's actually preferable to constructing an artificial barrier. If you do opt to build a fence or some other type of structure, don't paint it. Except in special circumstances, paint has no place in a Japanese garden. Natural, unfinished cedar, which is the species that best resists moisture and sun, is the building material of choice. Arranging rocks in odd numbers evokes the asymmetry inherent in nature. Some Japanese gardens consist entirely of rock and stone. The Zen masterpieces at Ryonaji, Ginkakuji and Tofukuji in Kyoto are three of the best-known examples. 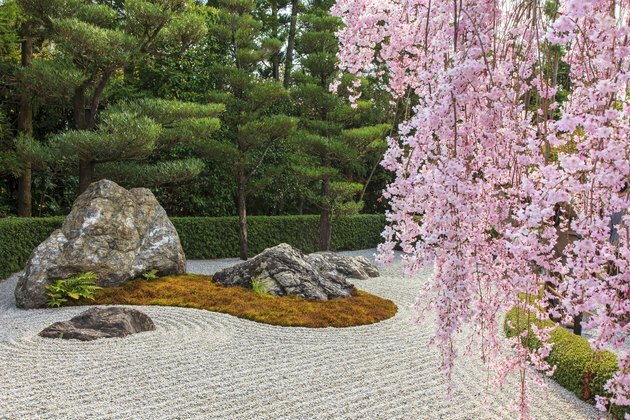 They feature raked gravel, asymmetrically placed rocks whose positions perplex the minds of viewers,s and—in the case of Ginkakuji—a centuries-old, perfectly shaped, conical mound of gravel. You may be considering a similar addition for your garden. If so, prepare for maintenance, because even the smallest weed or patch of misplaced moss disrupts the abstraction and is out of place. Garden maintenance is a daily responsibility for temple monks. You should at least be prepared to devote an hour or two several days a month to weed control, raking and general maintenance. If you don't want to go full Zen, you can still incorporate rocks and gravel into a more naturalistic framework. Use rocks that appear at home in the surroundings. For example, rather than using desert sandstone or lava rock, a collection of granite river rocks is more appropriate for a creekside setting or the border around a pond. Arrange the rocks asymmetrically and in odd numbers. You seldom find rocks arranged neatly in pairs in nature, so avoid that type of arrangement in your garden. By doing so, you adhere to the Japanese sensibility of wabi-sabi, the appreciation of the imperfection and transience of nature. If you use gravel for walkways and other features, avoid artificially colored material. Blanched gravel may work in an abstract Zen rock garden, but it's out of place in a natural setting. Instead, use a material with unmodified coloration that will blend in and become unnoticeable until you deliberately look for it. 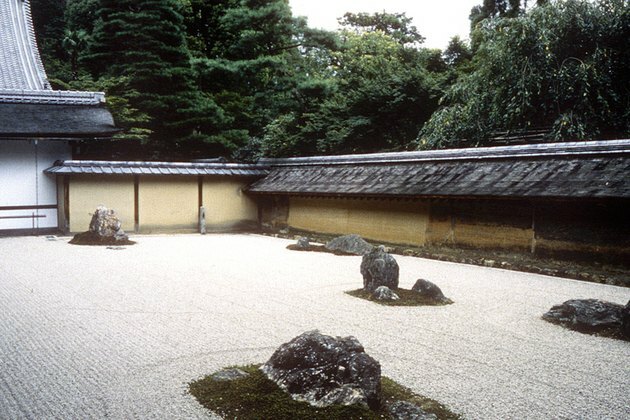 Moss is one of the most important components of a Japanese Garden. 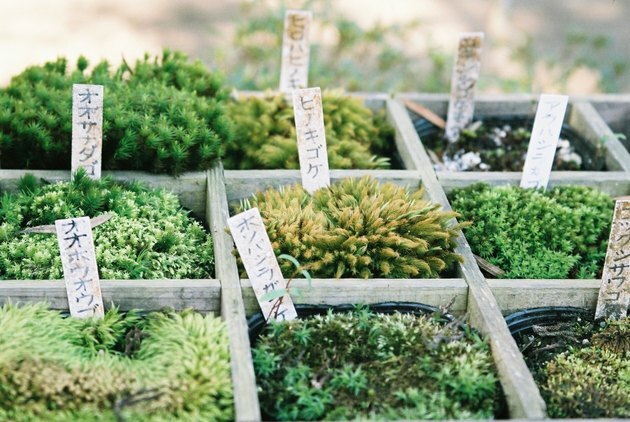 You may not live in a humid environment, but if you want your garden to have an authentic Japanese feel, you should find a way to incorporate moss. Moss provides a sun-absorbing, moisture-laden carpet that evokes the forest floors that you find throughout the humid Japanese archipelago. There are over 9,000 species from which to choose. Select the ones that do best in your climatic zone. Moss needs shade. You can create shady areas by planting tall shrubs and trees close together, or you can take advantage of any shade offered by existing trees or buildings. Moss also needs plenty of moisture. An easy way to keep moss happy is to snake a drip line through the moss bed and connect a sufficient number of micro-sprinklers or misters to keep the entire bed irrigated. Run the sprinklers at night to allow the water to soak in.